To hold an open house or not to hold an open house? The debate has raged on for years, with many agents abandoning the practice altogether. Some cite privacy and security concerns for sellers. Others simply feel that the effort isn’t worth their time. However, as many top earners will attest, the value of a real estate open house is tremendous. It offers sellers the opportunity to show their house in the best light—spotless and decluttered, complete with freshly cut flowers and cookies baking in the oven—which typically can’t happen with traditional showings where buyers stop by at all times. Even if you don’t sell a property the day of your open house, it’s not a waste of time. A real estate open house offers you the chance to interact directly and demonstrate your skills to potential buyers and sellers, who ultimately could turn into clients or refer you to other clients. Just make sure you abide by the following rules when you plan your first and subsequent open houses. Historically, the sales probability for open houses is relatively low, so make that known. Still, be sure to tout the other benefits to your sellers. An open house encourages sellers to get their property show-ready, clean, decluttered, and repaired as needed. That proves beneficial well after the open house date. Additionally, open houses make it possible for many people to see the property in one day. Plus, they often lead to indirect sales, with people who are only there to browse recommending the property to someone else. Most important, however, is that open houses provide the seller with valuable feedback on the property about the price, condition, and more, from a wider audience. If participants do not make an offer, you can find out why by asking them directly or requesting that they fill out a survey. That information can help you and the sellers take actions to get the house sold more quickly. Rare or in-demand. If supply-and-demand is low in your area or you are representing a truly spectacular property, you’ll see foot traffic at an open house. Attractive and well-maintained. In most cases, you want to highlight your nicest properties. Located in highly appealing areas. Your most sought-after locations are more likely to draw people in. Beyond that, you want to make sure your open house is easy to find; otherwise, people won’t show up. Curb appeal. Is the house welcoming and attractive from the street? Landscaping. Is it neat, trimmed, up-to-date, and colorful without being obnoxious? Is the lawn neatly mowed and weeded? Is there evidence of pet damage? Interior and exterior paint. Are colors neutral or consumer-friendly? Is the paint fresh and clean, not chipped and worn? Do secondary colors, specifically on the exterior, complement the main colors? Cleanliness. Is the house clean, organized, and uncluttered? Does it smell nice? Are windows clean so that you can open blinds and curtains to let in light? Pets. Sellers should make arrangements to have their pets away from the house that day. In addition, make sure that there is no evidence of pets, including hair, offending odors, toys, and so on. Many people will immediately be turned off if the home currently houses pets. Repairs. Do appliances, windows, flooring, and so on need to be repaired or replaced? What smaller fixes (e.g., broken molding, burned out light bulbs, old caulking, dirty grout) need to be taken care of? Schedule it at the right time. 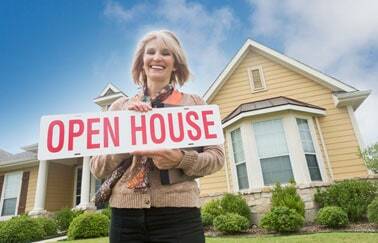 For maximum exposure, hold open houses on weekend afternoons for three- to four-hour time frames. It’s best to start them on the hour (e.g., 1:00 p.m.), but most important is that you start on time, every time. You don’t want to keep people waiting. Create informative marketing material. Ideally, you limit any advertisements or promotional material to one page, keeping them simple and eye-catching. Be sure to provide all the vital details, including the date and time, clear directions, and your headshot and contact information. Additionally, you want to highlight the home’s main features and amenities and provide a quality photo of the property. Get the word out. Let people know well in advance that you are holding an open house. Promote the event via email and social media. Send out postcards to key clients, prospects, and referral sources. Take out ads in local print and broadcast media. Use free advertising methods such as community bulletin boards and press releases, and by posting flyers at local businesses. Most critical, however, is to make sure that open house signs are visible from the road. Take full responsibility for the event. Although you can have an assistant present to help out or a loan officer around to answer financing questions and prequalify interested buyers, you need to be in control of the real estate open house at all times. Make sure that you have thoroughly researched the property so you can answer any questions. Don’t have the seller present. Your sellers likely have an emotional connection to the property—or a dire need to sell it. In the heat of the moment, they could say something that could cause people to lose interest in the property or make a lower offer. Create some ambiance. During the open house, turn on the lights and open the blinds to make things bright and airy; play soft music; and use subtle candles, air fresheners, fresh flowers, or baked goods to make the house smell pleasant. Come out and ask visitors to buy the house. Even with negative responses, you could learn what is keeping them from buying the house, which might be issues that the seller is willing to negotiate. At the very least, you create an opening to connect with them later to discuss other listings you are currently handling. Set some realistic prospecting objectives. Prior to the open house, decide how many attendees you want to draw, how many contacts you want to add to your lead list, and how many interviews you want to obtain from the new leads. Establishing these goals will keep you motivated to prospect during each open house. Just remember to be realistic, and base your goals on market size and the attendance results of other recent open houses featuring comparable properties in the area. Spend some time talking to each guest. Walk around the house, doing your best to connect with each visitor. You want to ask plenty of questions and gauge how motivated they are to buy or sell a property. Some may be interested in purchasing a different home, and others may be checking out the property because they want to sell their own in the neighborhood. Find out what they like and don’t like about the property, when they plan to buy or sell, and what they are looking for in a home. Capture contact information. In a visible spot near the front door, place a guest book or sign-in sheet to collect contact information and feedback. You will likely need to ask each visitor to sign it. Not everyone will, but do your best to capture contact information from at least half of your guests. Don’t be afraid to ask for a meeting. For people who seem motivated to buy, ask if you can schedule an in-person meeting—or at the very least a phone call. The worst they can do is say “no.” Ideally, you will schedule meetings with at least 25 percent of the guests who provide you with their contact information. Show your appreciation. No matter their interest level and response, shake hands and wish participants well as they exit. Provide them with a packet of information that promotes your business, conveys your marketplace knowledge, highlights your past successes (or that of your firm), and encourages them to follow up with you when they are ready to buy or sell a house. Follow up. If you promised to send additional information, do so as soon as you can. Also make certain that you keep any appointments you set. This proves your commitment and is critical to landing new real estate clients. Also, send out a thank-you message to everyone who attended shortly after the real estate open house. Schedule appointments. For those visitors who showed a good bit of interest, call them within two days of the open house, and again two to three days later if you are unable to reach them. With home buyer prospects, offer to go over suitable listings with them. With home owner prospects, offer to discuss their selling options. If you fail to schedule an appointment after two or three weeks, shift your focus to more interested real estate prospects. While you may be tempted to focus your time and effort on other pursuits right now, it’s wise not to overlook the benefits of holding a real estate open house. Open houses are particularly helpful early in your career—with some experts recommending that you hold at least one each week—as you work to grow your contact list and build name recognition in the community. For more real estate open house tips, check out our blog post on How to Conduct Successful Open Houses. Not licensed yet? Watch the brief video below to learn how to earn a real estate license in your state.